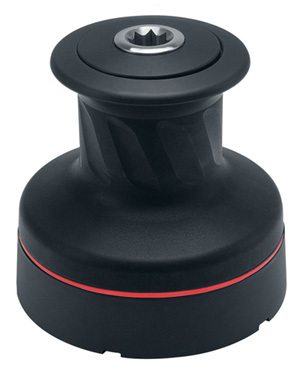 Introducing the all-new Harken Radial Non-Self Tailing winch line! Weight reductions between 25 and 50 percent, allowing smaller winches to carry higher loads; shaped gripping surfaces for reduced line wear; stress-free seasonal maintenance, and one-person installation with easy upgrades to power. The drum’s gripping surface is shaped for each winch size and drum material, and features diagonal ribs (rather than textured materials) to maximize gripping power and greatly reduce line wear. When easing, other winches tend to push the line wraps up. The Radial grip works more like a screw, driving the wraps down when easing to keep them on the part of the drum where you have the best control. Strong, lightweight composite roller bearings and bushing (in sized 20 winches) have excellent corrosion resistance and don’t require lubrication. The snap-fit design keeps bearings captive in a high-strength, Delrin® cage when the drum is removed for maintenance. Load-carrying gears and pins are 17-4PH stainless steel. Harken’s patent-pending stud-bolt mounting system allows one person to quickly install a winch through predrilled holes on deck—without removing the drum. Seasonal maintenance is also exceptionally easy. The drum lifts out as a single unit and roller bearings remain captive, making reassembly quick and mistake-free, with bearings lost overboard a thing of the past. Part of the design goal for Radial winches was that they easily convert to power, with upgrades an integral part of the design, rather than added as an afterthought. There is no need for an adapter plate and the identical stud pattern means no filling old holes and drilling new ones. Boatbuilders can make upgrades even easier by precutting and sealing a 3.00 in (7.6 cm) drive-shaft hole into the boat. Winch sizes are now determined by maximum working load (MWL) instead of power ratio. Maximum working�load measures the performance of the winch, as opposed�to the power ratio, which is the only a geometrical parameterof the winch. Every Radial winch is dynamically tested for�2,000 cycles pulling the MWL to evaluate wear on the�mechanical parts.